The Old Mission San Juan Bautista. I picked up a taxi fare, a young man who recently relocated to San Jose from the Midwest. He had landed a job with a major accounting firm. Life was good, but his income was still limited. Not yet knowing what the Bay Area had to offer, and needing a suggestion for a weekend date that would be unique yet wasn’t too costly, he asked for my help. For the price of a DVD, gas, and a few meals, I had an idea that might impress his new girlfriend – the Google employee. Saturday: Watch the movie while having breakfast at home. Then with a good map, of the city to our north, visit each site. * This may take most of the day. Sunday: Take a drive (45.5 mi – about 50 mins) down to San Juan Bautista and see where the films shocking climax was filmed. San Juan Bautista is one of my favorite getaway spots. Great little restaurants, and shops without looking too much the tourist trap. The chickens at your feet help keep it real. San Juan Bautista, California Community Profile and Map. San Juan Bautista wanted to get a jump on any San Francisco festivities with a special October event . Oct. 5 -7. 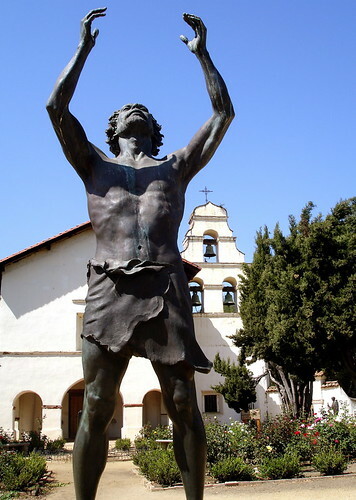 You know, that’s a great idea, a trip to San Juan Bautista! I’ve only ever driven through. I’ll pencil that in for one of the next weekends. Thanks for the tip! You will love it. See the movie first. Make sure to go through the buildings across from the Mission – See the place Kim Novak stood by the fake white horse. Report back to us. Let us know what you did and what you ate etc. Put your photos up on the Metroblogging San Jose flickr group. I took the kids there a few weeks ago. I hadn’t been there since I was… um… younger. I had forgotten that the end of Vertigo was filmed here until we walked into the Mission store where they were selling the movie.